I love it when the month, day, and year are the same. This is last time in my lifetime for it to happen. It has been fun for the past 12 years, finding these otherwise normal days and making them special. I dislike rain, but love the look of raindrops on the Heavenly Bamboo plants outside our kitchen window. I wanted to get a photo, though my photos never capture the same feel as looking out the window. I zoomed into several of the photos to see which one had the best focus. The reflection in one of the rain droplets seemed to be an eye looking right at me. It was in all the photos. Can’t really figure out what is being reflected to look like an eye. On the crafting front, I am making Rick a shirt for Christmas. I am putting an embroidery on the sleeve. I digitized the signature he uses on his paintings and added it to an Urban Trends design. The shirt is black and the embroidery will be subtle in dark grays. No photos yet. Instead I stitched out this Vintage Rose design, also from OESD, on muslin. I was looking at some 1920’s dresses and they had big roses embroidered all over them. I want to do the same, maybe on a top though. I don’t wear dresses anymore. 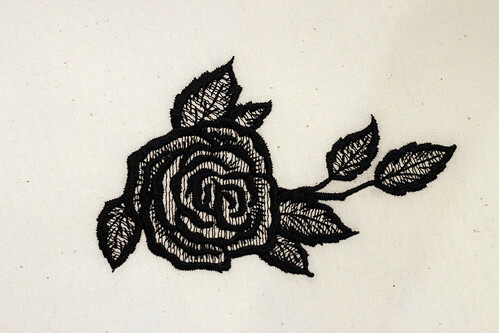 The actual embroidery file is for a multi-color ecru rose, but I think I like it all in black. Might even be interesting on a denim shirt. In spare moments I am trying to finish the never ending yoyo bag. I have 26 more yoyos to make before sewing the bag together. Then I need to decide on how I want to make a handle. I need something more practical than sewing the top two corners together as I did last time. That is all for this week. Why do the weeks fly by so fast? 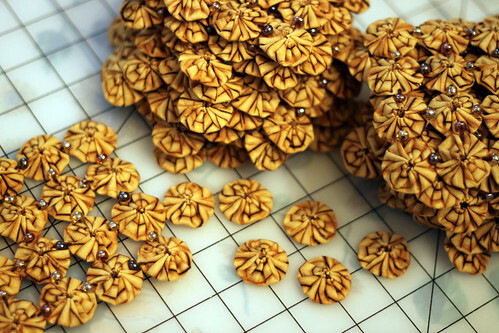 This entry was posted on Wednesday, December 12th, 2012 at 7:43 pm and is filed under Photography and Sewing. Tagged: Photo, Sewing, Yo-Yos. You can feed this entry. You can leave a response, or trackback from your own site. I like the rose in black and the color of your yo-yo purse. You have a great eye. 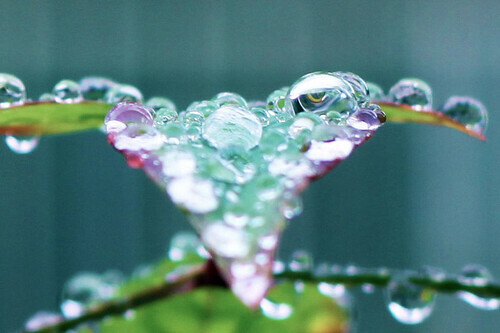 The photos of the raindrops are AMAZING! 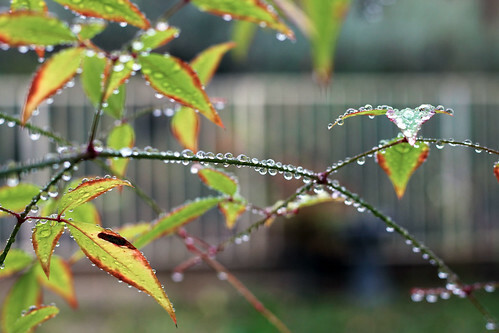 Great rain photos. Love the yoyos and the beads. I wish I knew how to machine embroider–can’t with this machine, but wouldn’t sew enough to invest in an embroidery machine.